How do I remove the SIM or USIM card on the Galaxy S6? 1. 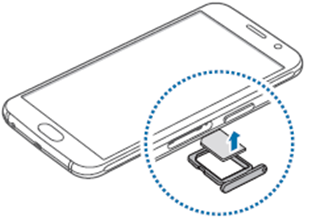 Insert the ejection pin into the hole on the SIM card tray to loosen the tray. 2. Pull out the SIM card tray gently from the SIM card tray slot. 4. Insert the SIM card tray back into the SIM card tray slot. Device gets heated during usage, why is this?